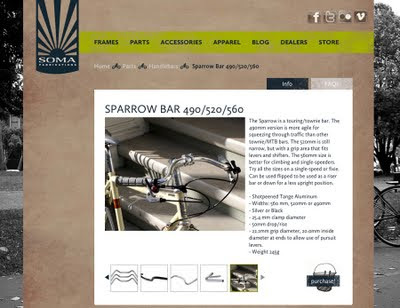 Soma Fabrications began with a discussion between Jim Porter of Merry Sales and Bradley Woehl of American Cyclery back in early 2000. Bradley observed that there were almost no more steel bikes out in the market, especially bikes that could be adapted easily for urban use. He had spoken with big brand bicycle sales reps about bringing back steel, but his requests fell on deaf ears. Eventually Brad approached Jim about the idea. Jim saw the potential. And thus Soma was born. 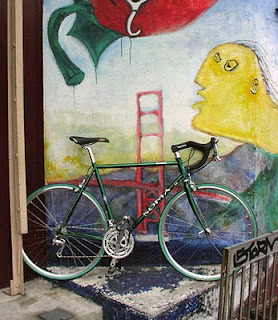 The first Soma frames were unveiled at Interbike on September 29, 2001. It was an exciting but somber week. 9/11 had the country in a cautious daze. We were afraid of low turn-out at the show and I’m sure the thought of having our flight hijacked flitted through each of our minds at least once when we were getting ready to leave for the show. Hotel rates in Vegas were at bargain basement rates, so instead of staying at the Vagabond Inn, we treated ourselves to the posh Venetian Hotel which is conveniently connected to the convention center. The four frame line (Double Cross, Smoothie, Groove and Rush) enjoyed a decent if subdued introduction to the world, but we did have a number of industry folks including Kona dropping by to wish us well – which was very encouraging. One of the first Smoothies ever built. So this month we are officially marking Soma Fabrications’ 10th anniversary. Ten years of producing frames, parts and accessories for the “everyday cyclist” To help commemorate this occasion, we commissioned illustrator and muralist, Mona Caron, to produce a poster for us. We think the piece turned out beautiful and it will definitely help inspire us to keep producing practical gear for everyday cycling. 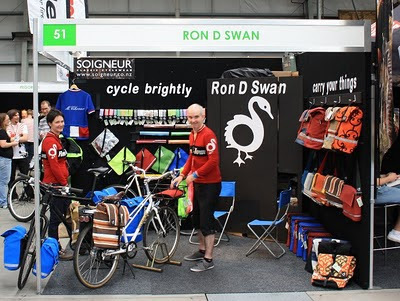 Ron D Swan posted a photo of our Buena Vista mixte that they used at the Ausbike tradeshow in Melbourne to display their stylish panniers. I don't believe they are available outside of Australia yet. Much of the materials they use in their products are would-be discards from other companies. So you are getting a product that not only looks good, but made by a company that is environmentally conscious. Hopefully someday these will make it to the U.S.
Last week we finally announced the imminent release of the Tradesman cargo frameset, but we hinted there would be more cargo news to come. The last couple of months we have testing a new design that was developed with Tange Design (the tubing maker, but they also design frames now). It would be classified as a “front loader” design if we followed the terms collected by Velo-City.org. It’s got a steering linkage reminiscent of the Baakfeits cargo bikes, but shorter. The steering linkage enables the bike to have stable handling characteristics under load. We discovered a person who rides bikes casually can ride the bike carrying a 150lb load safely without struggling to maintain control. We brought the bike to UC Berkeley during Caltopia last month and it got a lot of attention. Somehow, college girls seem to flock towards the dorky-looking bike instead of the incredibly handsome guy riding it. I have nick-named this project bike the "Pick Up Artist" for now. Engineering students approached us asking what CAD program we used. Fellow riders rode up and complimented how cool the bike is. Of course testing the bike with college girls (and boys) sitting on the front isn’t really what we consider adequate testing. 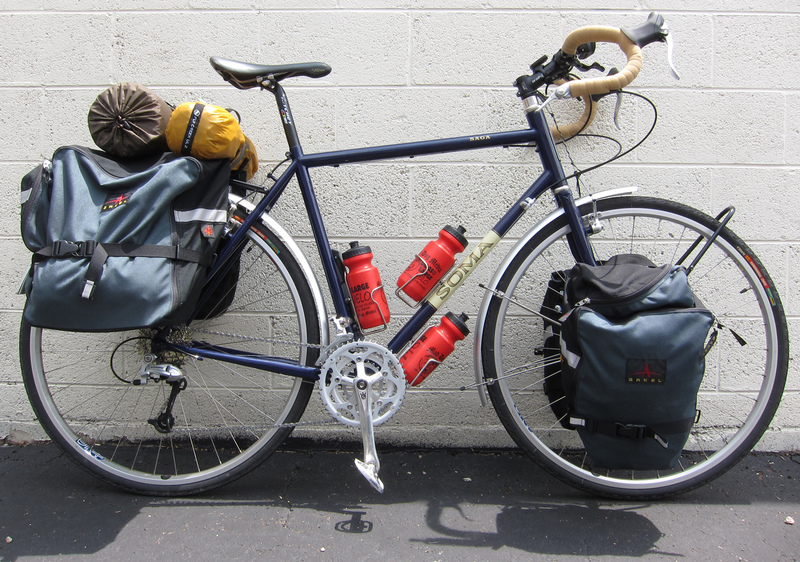 We also bolted on a Wald 139 on the rear rack and it enabled us to utilize the back of the bike for hauling more stuff. The basket made wonders for grocery shopping. We can now carry a 24-pack of Corona and get essential food stuff like palettes of Top Ramen. 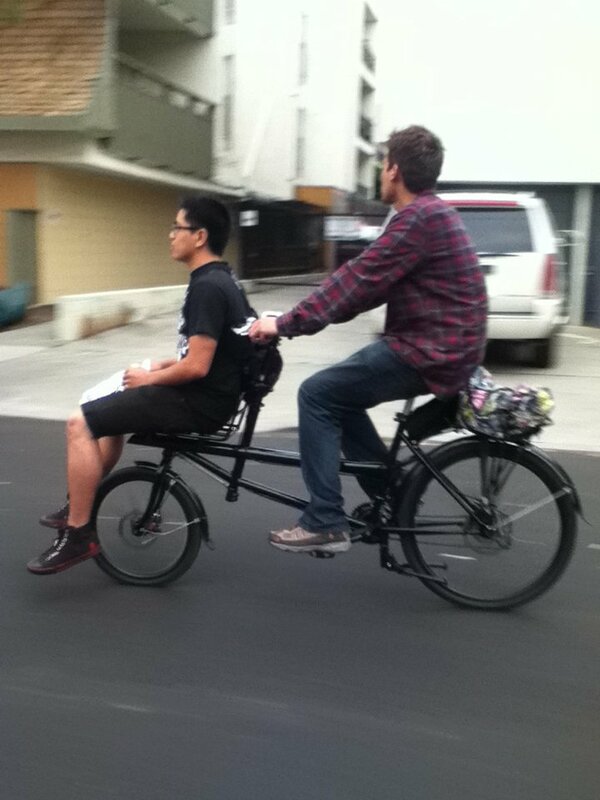 We put about 150 lbs on the front, but a good rider could probably manage 200 lbs. Final notes: The wheelbase of this is 1350 about 225mm longer than the Tradesman, so its turning radius is a little wide, but it also adds to its stability. It has a 20” front wheel and a 26” rear wheel. To facilitate fitting in a smaller shipping box, the steering column folds down and the platform is modular. Platform was pretty basic and could use user-friendly attachment points. 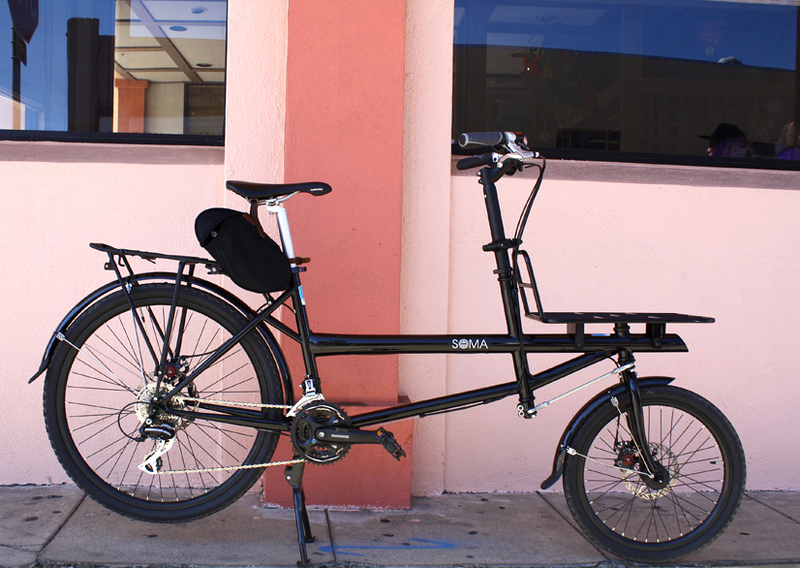 Sample was built with Avid BB-7 brakes and adequate performing Acera parts and included a rear rack. Estimated retail price for that basic build would be somewhere around $1500. We think Pick Up Artist is a fun bike to have, but we HAVE NOT made up our minds whether to add a second cargo bike to the line-up. To repeat this is NOT in our 2012 line-up. 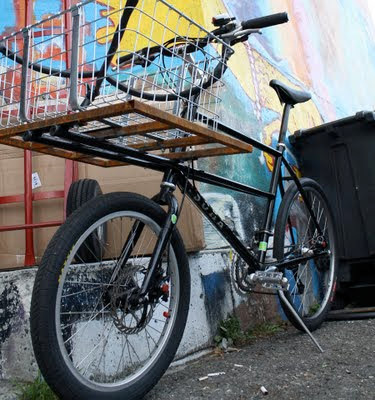 So we’d love to hear your opinions on this design, price, and cargo bikes in general. UPDATE: The Pick Up Artist will be available in early 2013. 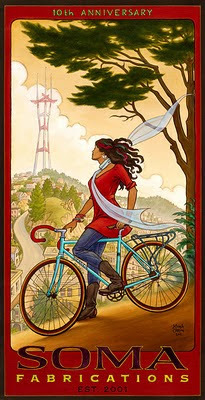 So what do you think utility bike fans? Adventure Cyclist, the magazine of the Adventure Cycling Association, looked us up one day late last year hoping to review a Saga frameset. We were unfortunately out of the size their guest reviewer Patrick O'Grady needed. We eventually got him a frame and some parts in the spring. We were happy to have Patrick be the tester, since he and his wife both own Double Cross's [purchased at retail price], so they have a good idea of how our frames ride. The review appears in the Aug/Sept. issue. Some select quotes: "I was suprised how well the Saga climbed while loaded – at no point did I feel as though I was wrestling with the bike...Adding weight to the front made the Saga track as though it were on rails. I was perfectly comfortable twisting around with one hand on the bars to check for on-coming serial killers." UPDATED 9/27/11: Download a copy of the review here. Our brand spankin' new website is finally up. Just in time to mark our 10th anniversary. A redesign was long overdue as most of you would probably agree. It still has some bugs (like controlling which images come up first in the 'Frames' section) but I think you'll find it a lot easier to browse. It also allows us to post reviews on the same page as the frame model. (Product reviews up til now were located on the Somafeed blog.) Plus it also lets us post more product images...which we put to use in giving at least three views of each of our handlebars, which we think customers will find useful. E-mail us if you find any broken links. Thanks. 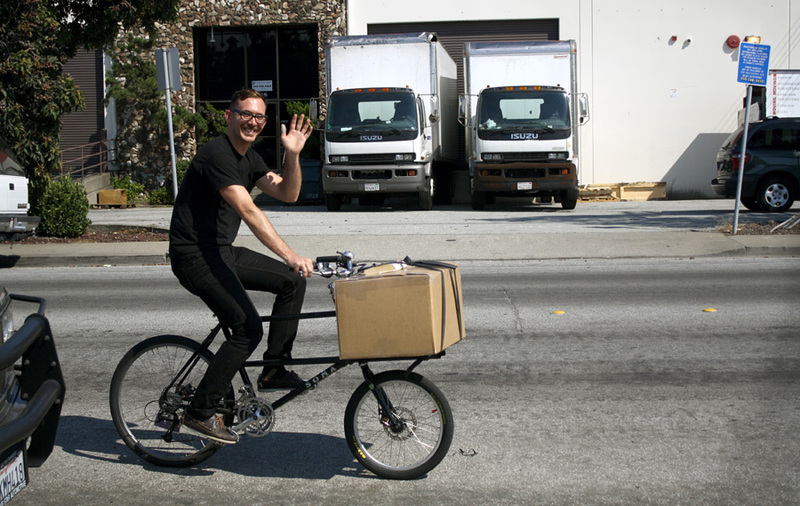 We at Soma have been quietly exploring making cargo bikes for a while now. 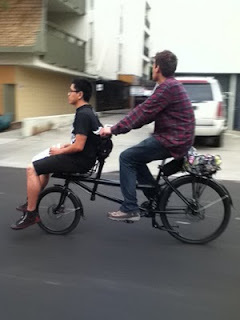 Soma has always first and foremost been about practical transportation and cargo bikes are definitely practical. Our first attempt is along the traditional English "baker bike" design --- which we are calling the Tradesman. It is designed for personal hauling rather than industrial use. Should handle well with loads around 40 to 50 lbs. It is made with light but strong Tange Infinity CrMo steel tubing. At 22" inches wide and 68" long, it'll fit through narrow apartment doorways (was developed by a 2nd floor apartment dweller). Features a large high-tensile steel platform mounted to dual horizontal stays that extend to the seat tube (the platform does not turn with the fork/handlebars). Unlike many cargo options out there, the Tradesman will be available as a frameset only, so all you "project bike people" should to appreciate that. - Modular high-tensile steel rack. Mount wood to it. Mount a Wald 157 to it. Put a massive crate on the front. 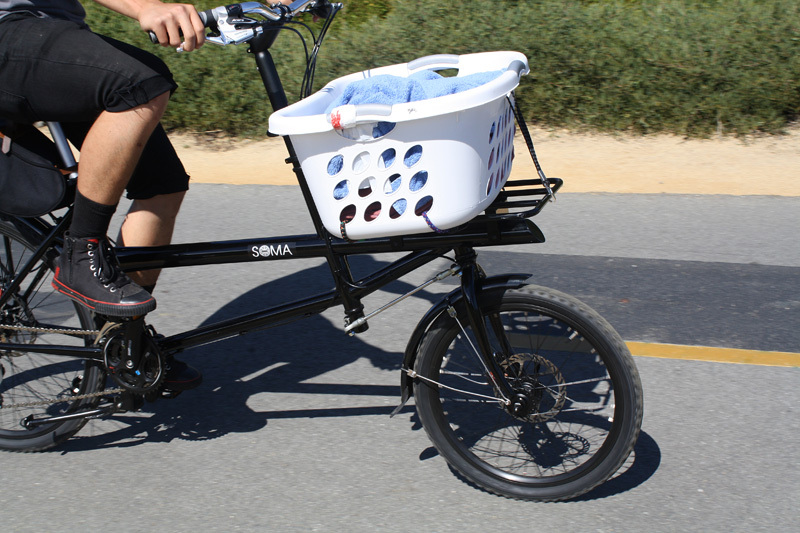 Stay tuned for MORE cargo bike news from the SOMAfeed next week. Prototype #1: We didn't get the fork rake right on this one. little distinctiveness to the look. Platform will be powdercoated, too.